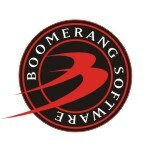 Boomerang Software was founded in 1997. Has a successful track record of over 12 years of stable operations, western style management. For many years it has created models, applications and back-end servers for e-transactions. Over 200 man-years of work. Provide complete software solutions for transactions web portals. One of the leading providers of client-side E-Commerce Web-based tools with over 2 million unitsshipped. Created solutions for known apps such as HP, AOL, Microsoft and others.